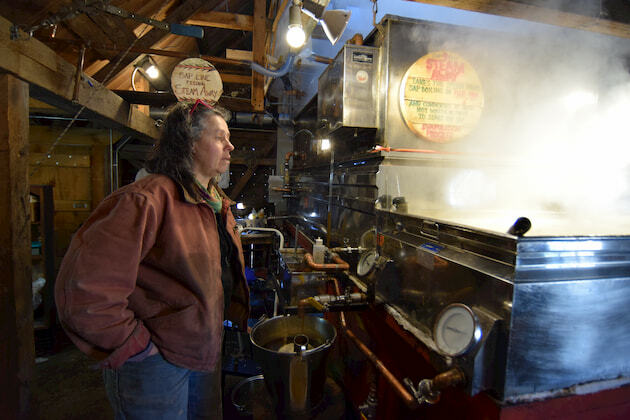 Sugarmaker Wendy Dutton boils on March 26 at Dutton's Farm Stand in Manchester Center, Vt. "I've only boiled six days so far," she said, far behind last year's pace. The sugarhouse at Dutton's Farm Stand in Manchester Center, Vt. on March 26. Sugmaker Wendy Dutton reports she is only one fourth of a crop so far, this late. 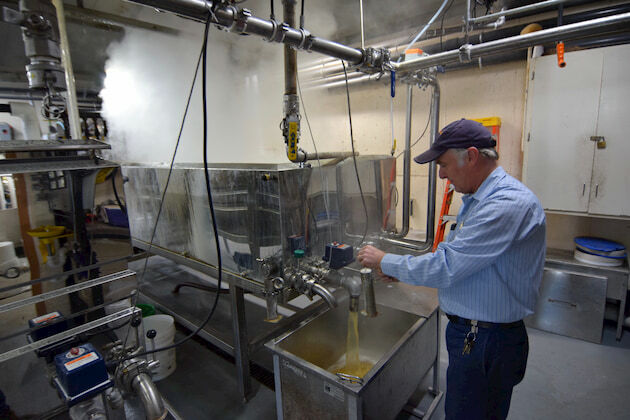 Chief boiler Kevin Bascom at Bascom Maple Farms in Alstead, N.H. on March 26. Bascom boiled 19 hours on March 25 and made 3,277 gallons, his biggest day ever. 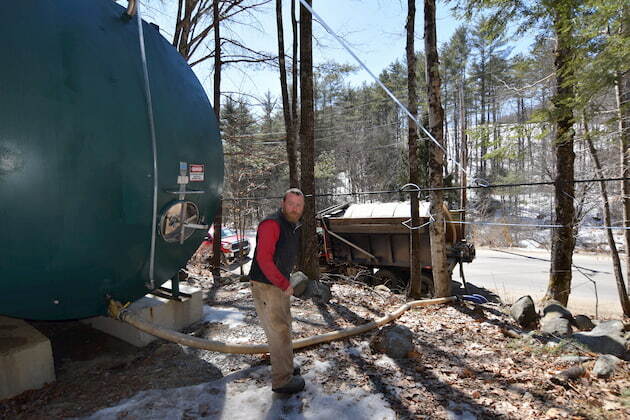 Greg Bascom of Bascom Maple Farms in Alstead, N.H. collects on March 26 on one section of the 90,000-tap sugarbush. Bascom is about half a crop so far, way behind last year's pace. Outdoor boiler Jonathan Finney of Jackson, N.Y. fires the arch on March 25. Finney said he had boiled for five days straight, during his biggest week ever this week. 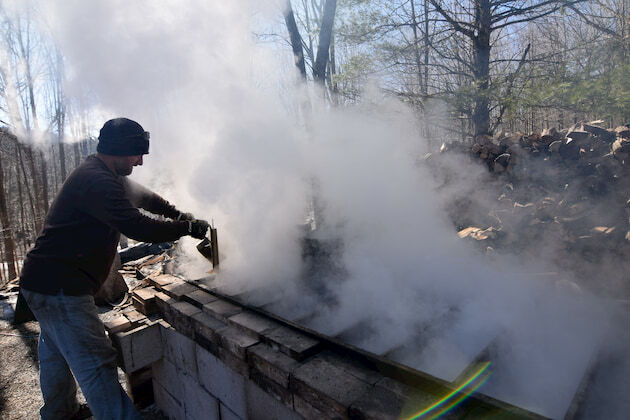 Sugarmaker Jonathan Finney of Schoolhouse Maple in Jackson, N.Y. checks his density during a boil on March 25, during an epic five-day run in his area. 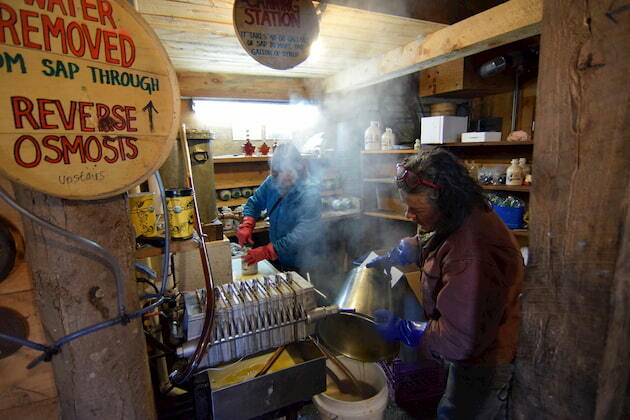 Sugarmaker Wendy Dutton of Manchester Center, Vt. and assistant Laura Yanne jug up syrup during a boil on March 26. 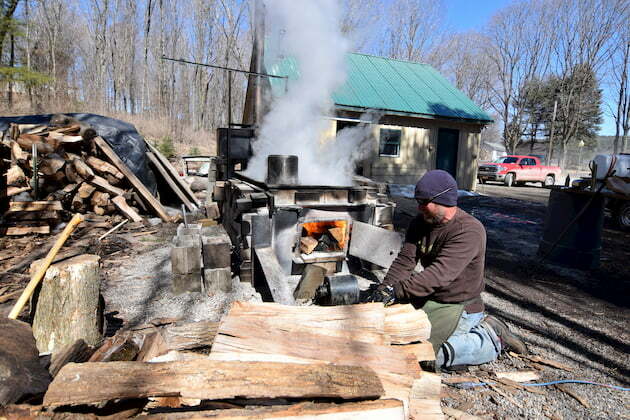 Sugarmaker Greg Smith offloads sap at The Maple News sugarhouse in Hebron, N.Y. on March 27. The wall calendar at Bascom Maple Farms in Alstead, N.H. on March 26 tells the story of the season so far. Last year the farm had made 47,351 gallons by the same date last year. CADOTT, Wisc.—Sap was running everywhere this week, even in the Midwest which had barely started only a week ago. “It’s running good here in some areas but the North is still a little slow,” said Peter Roth of Roth Sugar Bush in Cadott, Wisc. Roth estimated he was at about 35 percent of a crop at his farm in Cadott, Wisc. as of this week. Chris Ransom of Vadnais Heights, Minn. and president of the Minnesota Maple Producers Association said the season in his state was just starting to wake up after a harsh winter, but generally not too far off a typical start time for the season. “At my place anyway, my average first sap run has been on about March 10 each year. This year it was the 15th so not much of a delay,” Ransom told the Maple News on Friday, March 29. “I’d say we're at the beginning of the season and that most people are optimistic that the weather patterns are ‘textbook’ for sapping for the next week or so,” he said. Like many sugarmakers this season, he said sugar content in the sap has been a big improvement. “I’ve had a higher that normal sugar content, 3 percent consistently vs 2 percent in the past,” he said. Meanwhile, back in the Northeast, the season is rollicking. In Northern Vermont, things are starting to catch up after a very sluggish start. In New Hampshire, mega-boiler Bascom Maple Farms in Alstead, N.H. was pushing this week toward a half of a crop on their 90,000-taps. “We’re way behind schedule,” said Greg Bascom, who is in charge of much of the collection at the farm’s seven sugar bushes. 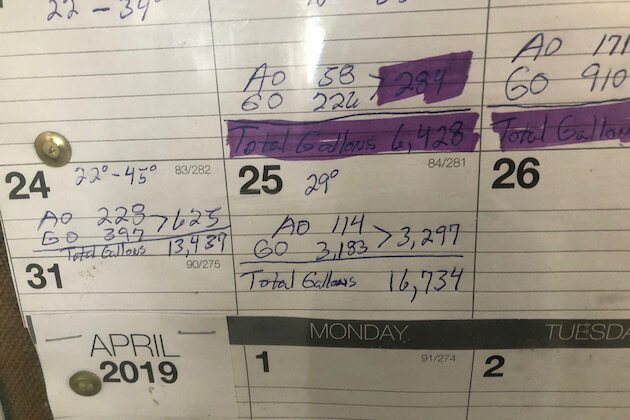 Bascom’s has made 16,734 gallons as of March 26. At the same time last year they were at 47,351 gallons. But some big runs in the past week have moved them forward. 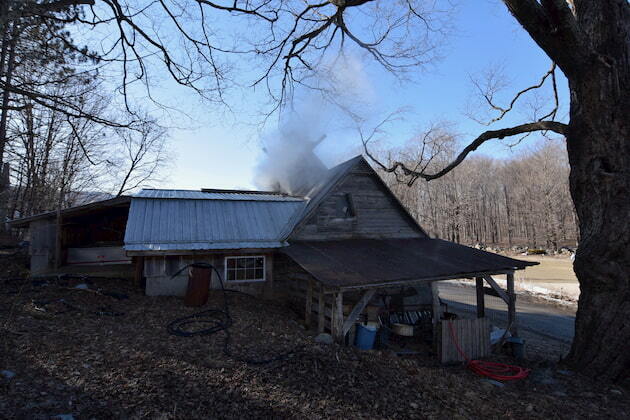 Chief boiler Kevin Bascom said he had the biggest single day ever for the farm, making 3,277 gallons during a 19-hour marathon boil on March 24. “That’s the most I’ve ever made in one stretch,” Bascom told the Maple News. Bascom too was happy with the improved sugar content. Despite the big week this week in the East, many are worried that time is running out. “I’m at only about one fourth of a crop,” said Wendy Dutton of Dutton’s Farm Stand in Manchester Center, Vt. on March 26. Dutton boils off 3,000 taps collected from various spots in Southwestern Vermont and has had a short season so far. “I’ve only boiled for six days,” she said. She was at 330 gallons for the season on March 26, far behind the 1,100 gallons she had at the same date last year. In Belvidere, Vt. sugarmaker Dean Parent was only at 10 percent of a crop on his new 25,000-tap operation. In Connecticut the season is over for most, with generally happy sugarmakers. “It’s been an unbelievable season for me,” said Nathan Heath. 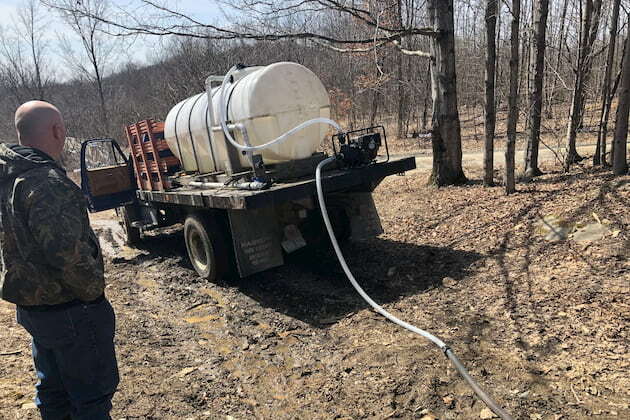 Heath reported that he collected more than 1,700 gallons of sap on his 120 buckets. “And it was all light clear sap, right up to the very last week,” he said.